Have questions about unclaimed property? Get answers here! Below we’ve listed and answered the most common questions we receive. If you would like additional information, please contact Keane by completing this form or calling 1.866.421.6800 for assistance. When does property become “abandoned”? Property is considered abandoned under state law when the property in question has had no owner generated activity for more than the statutory dormancy period specified by the state, or mail correspondence has been returned from the post office due to an invalid address. Dormancy periods vary depending on the property type and by state or jurisdiction. How does the unclaimed property process work? When property remains unclaimed past the state mandated dormancy period, the property will then escheat to the state. Each state has its own set of unclaimed property statutes that govern how property remitted and escheated to the state is to be handled. State unclaimed property laws give organizations instructions to turn over any unclaimed property with the intent on locating proper owners or heirs. Organizations may also hire companies, like Keane, who will assist in locating and notifying owners/heirs of their rightful unclaimed property before it must be turned over to the state. It is important to remember that the state holds this property in a custodial manner, meaning that their ultimate responsibility is to ensure the return of this property to the rightful owner. What are the unclaimed property reporting requirements? To say unclaimed property reporting is complex is an understatement. The intricacies of the requirements and regulations vary by jurisdiction and property type. Answering the who, what, where, when, and how of unclaimed property reporting for each jurisdiction can prove to be extremely challenging.  In what jurisdiction(s) am I required to file an unclaimed property report? How do the states enforce penalties or interest for non-compliance? What are the requirements for filing in this jurisdiction? When are reports due, and is a due diligence mailing required? What legislation has passed recently that has altered state reporting requirements? There are 55 different answers to each question above and these answers are dependent upon the legislation and regulations set forth by each individual jurisdiction. Does your organization have a process for addressing these questions? More importantly, does your organization have the resources to fulfill these obligations? What are the penalties associated with not accounting for unclaimed property? Filing an unclaimed property report is required for almost every holder and as such, it is imperative for holders to ensure they are not under reporting, over reporting or failing to report entirely. Failing to report, or reporting incorrectly may result in fines, penalties, and interest assessments from the State. Noncompliance also increases the risk of an unclaimed property audit conducted by the State, or a third-party auditor operating on their behalf. NAUPA is an acronym for the National Association of Unclaimed Property Administrators. The National Association of Unclaimed Property Administrators is the foremost authority on unclaimed property and the affirmed leader of the coalition of states, administrators, and holders working together to reunite rightful owners with their property. NAUPA also outlines the property codes and types that are typically used by organizations within their state-mandated unclaimed property reports. For more information about unclaimed property and how Keane can assist your organization, contact us online or call 1.866.421.6800.